For the hockey player, see Jim Ross (ice hockey). 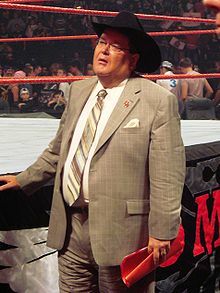 James William "Jim" Ross (born January 3, 1952 in Fort Bragg, California) is a professional wrestling commentator. He is also known by his nicknames Good Ol' J.R. or simply J.R.. Ross is a restaurateur, former professional wrestling commentator and former company executive. He is most well known for working for World Wrestling Entertainment (WWE) as a play-by-play commentator. He was inducted into the WWE Hall of Fame in 2007 and is widely regarded as one of the greatest commentators in wrestling history. ↑ Ross, Jim (January 5, 2008). "J.R.'s Blog " Happy New Year Everyone! Lots of Feedback Answered Today... Life Goes On... and So Does Work." JRsBarBQ.com. Retrieved 2008-01-06. I was born on January 3, 1952 in Fort Bragg, California. ↑ "Pro Wrestling's Best Commentators; A Fan's Take". Yahoo! Sports. Retrieved 13 February 2013. ↑ "Ring Posts:The best and worst wrestling announcers". The Baltimore Sun. Retrieved 13 February 2013. This page was last changed on 21 February 2018, at 16:17.